==The Mongols sweep down from the north during this century and overthrow settled states, kill hundreds of thousands, and threaten all of Asia. Above all, they shatter the Muslim world; in 1258 Hulagu Khan and his forces reach Baghdad and kill the last 'Abbasid Caliph. The Mongols are a constant danger to South Asia, and the new Delhi Sultanate is forced to guard its northwestern frontier at all costs. To help them do it they have a constant influx of refugees fleeing from Mongol-dominated Central Asia and Iran. For a pro-Mongol view: *Met*. Discussion: *The Mongols*; *Ikram Chs. 3-4*. ==Sultana Raziya (r.1236-40): The death in 1236 of Iltutmish, the second ruler of the Delhi Sultanate, is followed by a succession struggle. His capable daughter Raziya, whom he himself has groomed for power, seizes the throne and struggles to keep it; but she is not accepted by the nobles, and is eventually defeated and killed. ==the Mongols sack Lahore (1241): In the chaos after Iltutmish's death, the Mongols under Hulagu Khan break through the Sultanate defences and sack and destroy Lahore, which remains almost deserted for years thereafter. Not until 1270 does one of Iltutmish's successors, Balban, restore the fortifications of Lahore and re-garrison the city; he also builds a strong chain of new fortresses in the northwest. Like the Delhi fort, the Lahore fort too contains many historical layers that all occupy the same general site. ==Baba Farid (d.1266), a Sufi of the Chishti order, is also popularly called "Ganj-e Shakkar" ("Treasury of Sugar"). His official name is Shaikh Farid ud-Din. He shuns Delhi and lives in retirement in his home town of Pakpattan (Ajodhan) in the Punjab. There he composes devotional verses that are the earliest examples of Punjabi literature. He is revered by Sikhs too, since a whole set of his verses are included in the Guru Granth Sahib: *sacred texts*. ==Amir Khusrau (1256-1325): The great Indo-Persian poet Amir Khusrau is a devoted follower of Hazrat Nizamuddin Auliya. He is always proud of his Indian origins, and boasts about them in his many works of Persian prose and poetry. He also writes of composing some verses in "Hindavi"-- but only casually, to amuse his friends; and he doesn't bother to record them. Many Urdu verses and riddles are nowadays attributed to him; but alas, they comee from a much later period, and to call him "the father of Urdu" is meaningless. A fine website devoted to him: *angelfire*. A lovely illustration of one of his poems: *Met*. His tomb is within the dargah of Hazrat Nizamuddin: *Time*. 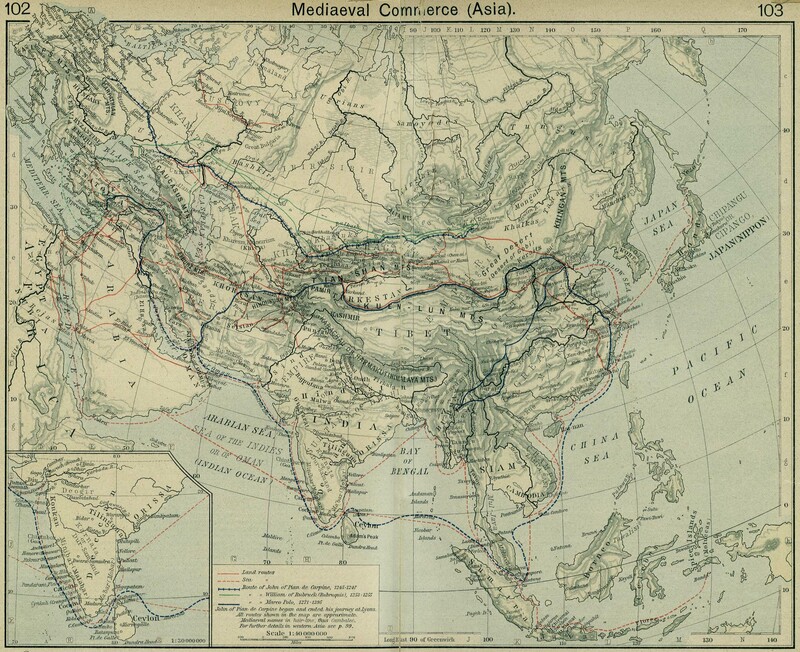 ==Trade routes between Europe and Asia are maintained by all parties, and continue to flourish under Mongol rulers as they have flourished under earlier regimes. This large and very helpful map is a detailed overview of how the world looks during the 1200's, and shows the main trade routes by both land and sea. ==Namdev and Jnanadev: These two Marathi bhakti poet-saints are part of a distinct Maharashtrian bhakti tradition of devotion to Vitthal (or Vithoba), a deity whose shrine is located in the town of Pandharpur. A modern devotional account of these two saints' lives: *Swami Shivananda*. Some of Namdev's verses are included in the Guru Granth Sahib (for example, *sacred texts*, parts 15-17). ==Marco Polo stops by (c.1290): Marco Polo is believed to have landed in Tamil Nadu and sailed up the Malabar Coast on his way back from his long stay in China. More on his fabled (?) journey: *silk road*.